Magic Audio Converter and CD Ripper - just the best audio converter! Magic Audio Converter and CD Ripper offers a quick and easy way to back up your entire music collection. With one-click CD ripping and format conversion, the tool will back up your Audio CDs into a bunch of audio files in AAC, MP3, OGG, WAV, WMA about a dozen other formats, or produce you a completely lossless music library in the FLAC format. Magic Audio Converter and CD Ripper makes ripping an audio CD an easy job. Just insert a CD, and the program will automatically retrieve information about the album and track information from the Free DB database. Select all tracks you’d like to rip and specify output format, and Magic Audio Converter and CD Ripper will do the rest automatically. Convert music between all popular mainstream audio formats! Magic Audio Converter and CD Ripper can accept Audio CDs, individual files or entire folders full or audio files in a wide range of audio formats, and produce a music library in a format of your choice. With audio format conversion, you can quickly turn a bunch of tunes in MP3, WMA, FLAC, OGG and other formats to a single audio format. Not all media players are created equal. Some may prefer AAC or WMA files, while others are strictly MP3. Apple iPod players prefer AAC, M4A, M4B and ALAC formats, delivering the highest audio quality. With Magic Audio Converter and CD Ripper, you can convert your Audio CDs directly into the format preferred by your portable player, skipping intermediary steps and avoiding the use of third-party software. The abundance of audio devices is one of the reasons you need this tool. If you download music from the Internet, you may have your music collection scattered between MP3, WMA, FLAC, OGG and a bunch of other formats. Eventually, you’ll end up with a collection that won’t be fully playable anywhere except your PC. To listen to your music using your favorite portable player, you’ll need your collection to be in a single format supported by that player. Use this audio converter to manage your growing music collection and keep it organized! Play Your CDs on Your iPod.Pay Nothing to iTunes! iPods don’t play CDs. That’s a fact of life. While you can always download the same songs from iTunes, why paying for music you already own when you can simply rip Audio CDs directly into an iPod-supported format? Transfer your favorite music from CDs to Apple iPod without losing quality or paying for iTunes downloads! Apple fans will appreciate the support of native iPod formats, including AAC, M4A, M4B and ALAC, combining near original sound quality and compact size. In addition, if you have music files that won’t play in your iPod, Magic Audio Converter and CD Ripper will quickly convert them into the ‘right’ format in just a few clicks. Magic Audio Converter and CD Ripper comes equipped with a range of lossless audio codecs, allowing you to back up your entire CD collection without losing audio quality. The FLAC format is universally accepted and ideal for long-term storage, while ALAC-encoded files are still lossless and directly playable on your iPod. 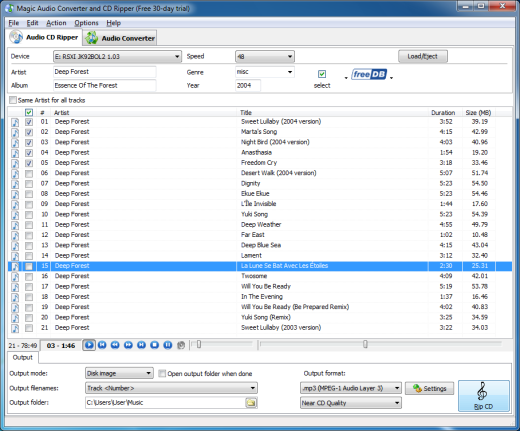 The fast and high-quality CD audio grabber works closely together with the program’s audio conversion engine, enabling you to create complete copies of your audio CD’s. 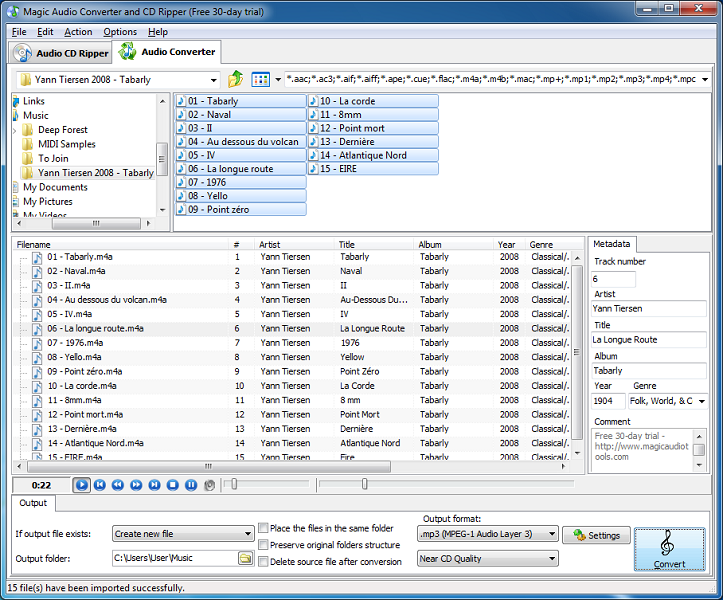 Rip CD audio tracks into a variety of popular audio formats or rip the entire audio CD into a single file accompanied by a CUE file. If absolute audio quality is what you’re after, make use of one of the lossless formats such as APE or FLAC. If disk space (or player memory) is of major concern, rip audio CDs directly into one of the compressed formats such as ACC, MP3, MP4, WMA or OGG. 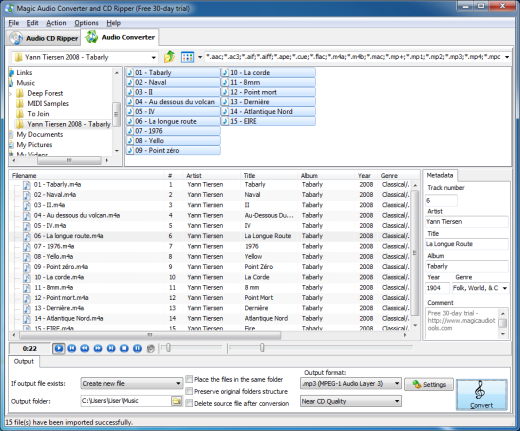 Magic Audio Converter and CD Ripper sports an integrated tag editor, letting you edit metadata tags for each file before conversion. ID3v1.1, ID3v2, APE 1.0, APE 2.0, OGG and WMA tags are fully supported. Magic Audio Converter and CD Ripper is extremely easy to use. Its clean and intuitive user interface speaks 12 different languages, making it easy for everyone to use. Magic Audio Converter and CD Ripper offers convenient batch mode and supports multimedia playlists including .m3u, .m3u8 and .pls formats. The original folder structure will be preserved during the batch conversion. If you were shopping around for an affordable yet feature-rich audio converter supporting the maximum number of audio formats, you found one. Give Magic Audio Converter and CD Ripper a try and you will never need another audio grabber or MP3 converter! •	Supports MP3, MP4, WMA, WAV, FLAC, AAC, M4A, OGG, AAC, AC3, AIFF, APE, CUE, MP+, MP1, MP2, MPC, MPP, OFR, 3GP, 3G2, OFS, SPX, TTA, WAV, WMA, WV, ALAC. • Allows you to rip CD to aac, rip CD to m4a, rip CD to m4b, rip CD to alac, rip CD to mp2, rip CD to aiff, rip CD to m4r, rip CD to mp4, rip CD to wma, rip CD to wav, rip CD to ogg, rip CD to flac, rip CD to mpc, rip CD to ape, rip CD to mp3, convert: flac to mp3, flac to wav, flac to aac, ape to flac, ape to mp3, ape to wav, mp2 to mp3, mp3 to m4b, mp4 to wma, wma to mp4, wv to wav, wma to mp3, wv to mp3, ogg to mp3, mp4 to mp3. How to uninstall Audio Converter and CD Ripper? How do I uninstall Magic Audio Converter and CD Ripper in Windows Vista/Windows 7/Windows 8/Windows 8.1/Windows 10? Select “Magic Audio Converter and CD Ripper” and right click, then select Uninstall/Change. How do I uninstall Audio Converter and CD Ripper in Windows XP? How do I uninstall Magic Audio Converter and CD Ripper in Windows 2000? How do I access the Magic Audio Converter and CD Ripper download for PC? It’s easy! Just click the Audio Converter and CD Ripper download button at the page. Clicking this link will start the installer to download Audio Converter and CD Ripper free for Windows. Will this Magic Audio Converter and CD Ripper download work on Windows? Yes! 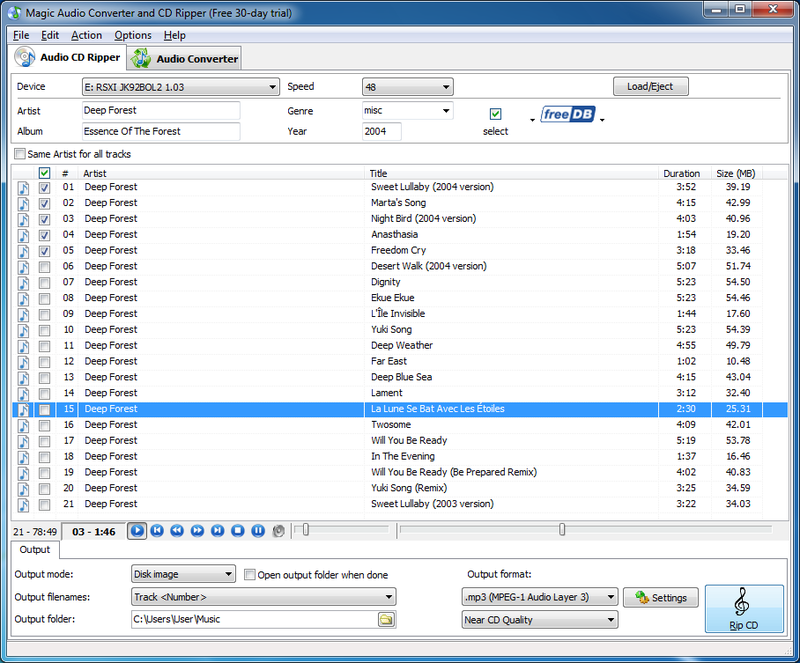 The Audio Converter and CD Ripper download for PC works on most current Windows operating systems.